How do you find the best meal replacement bars when you’re on a ketogenic diet? Is it even okay to replace meals with pre-packaged bars most likely loaded with carbs and sugar? What’s the difference between a meal replacement bar and a protein bar anyway? Are meal replacement bars even healthy? Despite the marketing claims made by many popular “health” bars, these can be anything but healthy when ketosis is your goal. So what are meal replacement bars and should you trust them to help you lose weight? What’s the Difference Between a Meal Replacement and Protein Bar? In the United States, the Food and Drug Administration (FDA) doesn’t have a strict definition for what a meal replacement bar must be or contain. Generally, a meal replacement bar is a prepackaged product intended to be eaten instead of a traditional meal like lunch or dinner. 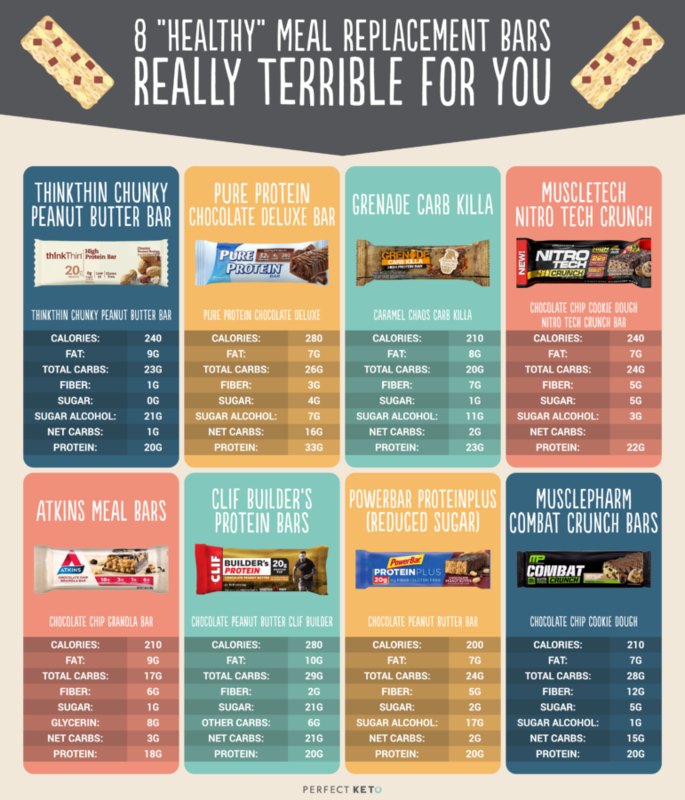 Meal replacement bars shouldn’t be your first choice for calories. Giving you easy portion control. One study showed dieters underestimate how many calories they eat by almost 40%[*]. Meal replacement bars show you exactly how many calories, fat and protein you’ll be eating so you don’t have to measure or guess anything. Helping you eat fewer calories. A typical meal replacement bar will run under 300 calories, or a lot less than an entire meal will cost you. If a meal replacement bar keeps you just as full, you may be able to shave off a few hundred calories to get you closer to your scale victory. Dieters in one study who used meal replacements lost an additional 5.5 pounds in three months and an additional 5.2 pounds at the 12-month mark than participants who didn’t use them[*]. Providing on-the-go fuel between meals. When you don’t have a keto meal lined up and you’re far from home, a meal replacement bar will keep you from jumping off the wagon and into the drive-thru lane. Participants in another study added meal replacement bars to their diets and reported less hunger after five hours and greater fullness in that same time compared to those who didn’t add the bars[*]. Even still, meal replacement bars should only be eaten in moderation and not relied on like a crutch. Meal replacement bars are no substitute for fresh, whole foods. But they can be incorporated as part of a healthy diet — as long as you find the right ones. Meal replacement bars are supposed to keep you just as a full as a real meal. So think about your normal breakfast, lunch or dinner: you want a high-quality protein, a decent amount of healthy fat and loads of fiber. Finding a balanced ratio of these three macros is the key to a healthy meal replacement bar. You need it to trigger your body to stop sending out hunger hormones and start suppressing your appetite after you eat it. That only comes from the right balance of protein, fat and fiber. There’s no use reading the rest of the label and calculating carbs if you’re not satisfied with the protein amount. A meal replacement bar should contain anywhere from 15–25g of protein. Anything less than this is more like a protein bar for in-between snacking. If your meal replacement bar fits this, proceed to the carbs (but don’t get your hopes up). The bane of most keto-ers in the meal replacement aisle, carbs are the biggest sore spot when it comes to narrowing down your choice of bars. Ideally, you want a bar with as few net carbs as possible. However, meal replacement bars, just like real meals, should also be an “excellent” source of fiber. That means you should try to find ones with at least 5g of fiber. Fiber is the ultimate when it comes to keeping you full between meals and stopping those unwanted cravings. If we’re getting technical, prebiotic fiber is the best choice since it feeds all the good bacteria in your gut to help them fight off the bad bacteria. A majority of a meal replacement bar’s carbs come from fillers and additives to keep the bar together and sugar to make it taste good so let’s move on to those next. Despite these “natural” sounding names, sugar is sugar when it comes to being processed in your body — and keeping you out of ketosis. A meal replacement bar should have no more than 5g of sugar (hopefully less!). Most brands know consumers won’t stand for “health” bars with as much sugar as candy bars. So now they’re starting to use artificial sweeteners and sugar alcohols. We’ll talk more about these in our section on suspect ingredients. No, not to see if your bar is too fattening or calorie-rich, but to see how much energy it will give you. When you’re on keto, fats are your main energy source — not carbs. So while traditional meal replacement and protein bars rely on carbs to bypass the afternoon crash, you’ll want to check out the fats after you scope out the protein and carbs. Reach for bars with at least 5–10g of fat. Once you research these macros, your final step is reading over the ingredients label for unhealthy additives, artificial sweeteners and inexpensive fillers. When you learn what to look for it will be easier and faster scanning the ingredients labels in the protein and meal replacement bar aisle. Sugar alcohols and artificial sweeteners, which add sweetness without the glycemic load or (sometimes) calories. Keep an eye out for vegetable glycerin too. Made from plant oils like palm, soy and coconut, glycerin is used as a preservative to keep meal replacement bars moist since it has a texture similar to oil or syrup. It also has a slightly sweet taste. And since it’s not metabolized like sugar and behaves more like a sugar alcohol, it won’t raise your blood sugar. You’ll see this ingredient often when you go low-carb. Though sugar alcohols have been approved by the FDA for use in food, maltitol, xylitol and many other sugar alcohols can lead to headaches, stomach cramps, gas, flatulence, diarrhea and more crummy health issues. Chicory root fiber, also known as inulin, a smooth functional fiber with a slightly sweet flavor. It doesn’t get metabolized by your body until it reaches your colon so while it can keep you regular, eat too much and it could have a diuretic effect. Polydextrose is a low-cal bulking agent synthesized from glucose and sorbitol, a sweet sugar alcohol metabolized slowly by your body. Tapioca fiber, a starch extracted from the cassava root, is a gluten-free wheat substitute which binds and thickens meal replacement bars for zero fiber or nutrients. Isomalto-Oligosaccharide (IMO). New research shows IMOs are actually partially digested, not insoluble fiber as once thought. You’ll need to count these as 50% of the total carbs instead of all fiber. Soluble Corn Fiber (SCF) replaced IMO in many popular protein bars. Still new to the market, current research says SCF doesn’t have any impact on your blood sugar or carb count like IMO. Therefore it’s subtracted from the total carbs. With your crash course in the best and worst ingredients wrapped up, let’s take a peek at ones you should definitely stay away from. When you’re in keto, you know close to 95% of the meal replacement bars on the market aren’t going to fit your macros. They’ll either have too many carbs, too much sugar or be overflowing in sugar alcohols. Bad news: meal replacement bars aimed at low-carb dieters can sometimes be more dangerous than those you know for a fact aren’t keto safe. It’s not cute when you get excited to see a meal replacement bar with zero grams of sugar only to find out it has 21g of sugar alcohols from maltitol and glycerin. At one net carb, you could be tempted to try this, but all that digestive upset should have you steering clear. The base of this Pure Protein bar lists milk protein isolate before whey protein isolate, which means you’re starting off with a less than stellar protein blend for a high 16g net carbs. Then there’s maltitol and maltitol syrup in everything from the bars themselves to the coating. Let’s not even talk about the fractionated palm kernel oil, glycerin and sucralose. While the 33g of protein may entice you, flip over the label where you’ll read all about how the ingredients were partially produced with genetic engineering and how consuming too many sugar alcohols can have a laxative effect. A clever marketing tactic that’s not quite as honest as they claim. Grenade Carb Killa bars are supposed to be high-protein, low-carb and keto-friendly. But there’s a major discrepancy in the net carbs they list and their actual effect on your body thanks to all the different types of sugar alcohols they use. One bar contains maltitol, xylitol and sucralose for 11g of sugar alcohols sure to upset your tummy. And these bars are also made with polydextrose and soybean oil — yuck. MuscleTech says their bars are better than their competitors because they use high biological value protein sources (which means whey over soy protein). But that doesn’t make up for the use of IMO and low-quality veggie oils like palm, palm kernel and soybean. Plus, these also pack in maltitol, sugar and sucralose for sweetness. Since these bars use IMO, you can’t trust their net carb count because IMO behaves more like a carb than fiber and cannot be subtracted from total carbs. 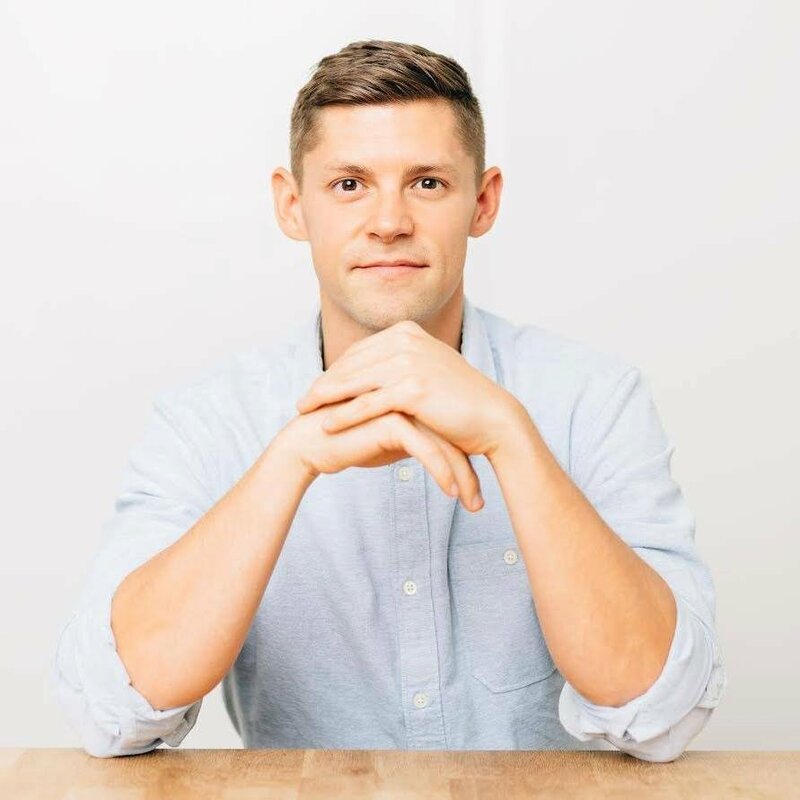 Atkins says their low-carb bars are made with simple, quality ingredients and zero refined sugars, artificial flavors, colors or preservatives. Their meal replacement bars list soy protein, whey protein and then veggie glycerin as the top three ingredients. These bars have just as much glycerin (8g) as fat (9g) and more glycerin than fiber (6g) for not a whole lot of protein. And they also mix in palm kernel oil, polydextrose and sucralose for good measure. So, not so good. Though all the ingredients may be organic in the Clif protein bars, it doesn’t mean they’re any good for you. The first five ingredients for a bar that’s supposed to help you build muscle are mostly sugar: soy protein isolate, beet syrup, organic brown rice syrup, organic cane syrup and palm kernel oil. No wonder one bar packs a whopping 21g of sugar! You may do a quick glance at these on the shelf and think the phrase “reduced sugar” has your keto name on it. Sure, these meal replacement bars may not register more than 3g of sugar thanks to maltitol but it also means you’re in for 17g of gut-wrenching sugar alcohols instead. You’ll also see polydextrose, chicory root syrup, glycerin and sucralose too. PowerBar has recently come out with a “Clean Whey Protein” line replacing the soy isolate protein with whey protein isolate and removing the artificial sweeteners, flavors and colors so you may want to check those out instead[*]. Combat Crunch bars don’t taste like the others on today’s list; they’re baked so they taste more like a cookie and less like a hard piece of taffy that sat in your attic for 15 years. But don’t give in to the taste when you find out what’s inside them — like 15g of net carbs. Here’s the even worse news: Combat Crunch bars still use IMO so you can’t trust their net carb count — high as it is — to be accurate. In reality, it’s probably much closer to 20g+ of net carbs. Though they use more sugar than sugar alcohols, these bars still contain glycerin, maltitol and sucralose too. So if you’re sick of spending more time reading labels (and leaving with nothing), maybe it’s time you start making your own meal replacement bars. Psst! They’re actually super easy to make. You don’t have to be a domesticated god or goddess to make your own healthy keto meal replacement bars. Whipping up a batch on your own means you can control exactly what goes inside your bars (and you may even save some cash). Before experimenting with your own concoctions, you may want to try our Keto Bars.